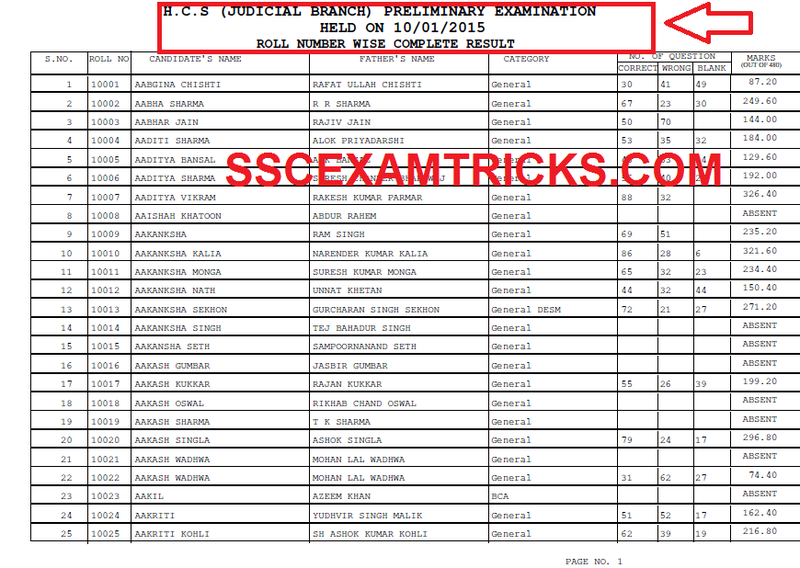 High Court Chandigarh has released the result/scorecard/marks details of Pre-examination which was scheduled on 10th January 2015 against Advertisement No. 7 dated 18.09.2014 recruitment for 119 posts of Haryana Civil Service (Judicial Branch) conducted at various centres in over the state. Around 17000 candidates had applied for these posts and 16186 candidates had appeared in pre-examination. Those candidates who had appeared in the written exam and waiting for the result/scorecards/marks detail can download their roll number wise result from the direct link provided below. · The RESULT will be displayed on the screen as PDF. · Press Ctrl + F keys to search your name. · Write name in search box. · Press Enter Keys till you find your name. · Save and print Result Page Hard Copy for Main exam requirements. The Pre-Exam was conducted on 10th January 2015. The Chandigarh High Court HCS EXAM 2015 was conducted by Pen MODE. In Pen Mode, there was OMR sheet which was to be filled by Blue/Black ball point pen. No rough blank sheet was issued for calculations/rough work in exam. The Exam was available in bilingual languages- English & Hindi. The exam was conducted an objective multiple choice question paper containing 125 questions of 500 marks which was to be finished within 2 hours or 120 minutes. The exam was a multiple choice question paper in which five options were provided out of which candidates need to choose one correct answer. There was a negative marking 1/5th or 0.25 allotted for each wrong answer. Chandigarh High Court HCS Pre-Examination was of qualifying nature and No Marks will be added in Final Merit List of Candidates will be called for Viva Vice or Interview of candidates. Note - Candidates equal to 10 times the number of vacancies advertised on the official website, selected in order of their merit list which will be prepared in descending order (category wise) will be eligible to sit in the Main Examination. Candidate who got qualified for the Main Examination will have to apply again on separate application form for the Main Examination for which they will be informed through an announcement which will be displayed on Commission’s website. The short listed candidates will be called for Main Examination which will be conducted at various centres in Chandigarh. Candidates thrice the number of advertised posts including bracketed candidates, if any, in order of merit of Main Examination will be called for viva-voce/ Interview.